He's a former investment banker and key Glazer family ally, seen as a driving force behind Manchester United's commercial growth. While Ed Woodward, 40, may not be a household name, he has built a strong reputation during his eight years at the Old Trafford club. And this summer Woodward will step into the limelight when he takes over from chief executive David Gill, who is standing down. 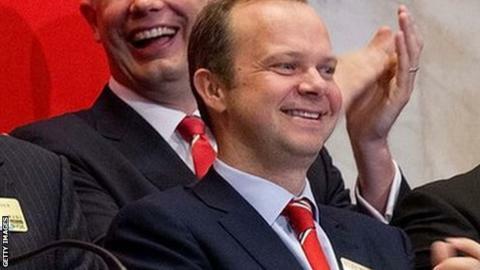 A significant figure in the Glazer family's 2005 takeover, Woodward has played a pivotal role at United ever since. As executive vice-chairman, the Briton is responsible for United's commercial strategy but, after Gill's departure on 30 June, he will assume responsibilities on the football side, including player transfers and salary negotiations. Woodward will retain his current title, and is expected to remain at the club's London offices, with commercial director Richard Arnold becoming the most senior figure based at Old Trafford. "There is a good stability here. That must help. The foundations David [Gill] has laid down from his side of it are easy to carry on from. There is a template there for us to follow. "The job is to support the manager and the staff to maintain the success they have. I don't think that should change that much." A close ally of the US-based Glazer family, Woodward told BBC Sport in a rare interview last October of his support for their financial approach, which has attracted vehement criticism in some quarters for loading debt on to the club. He said: "They don't view us as even being at base camp in terms of climbing the mountain of what we can do with this business. "Our debt, taking a house comparison, is like a mortgage. And it's small relative to the value of the business. And the person living inside it is getting richer and richer and richer in terms of income every year. "We're verging on £100m more a year of commercial revenue than when the Glazers bought the club." Woodward himself is largely credited with this upturn, overseeing a series of worldwide sponsorship deals that saw commercial income over the last three months of 2012 rise to £35.6m, an increase of 29% on the corresponding period in 2011. From 2014, one such deal will see Chevrolet pay United £51m a season for shirt sponsorship alone. A lead role at the 19-time English champions may seem an unexpected direction for a Bristol University physics graduate, although Woodward began his career with PricewaterhouseCoopers' accountancy and tax advisory department in 1993, qualifying as a chartered accountant in 1996. In 1999 he moved to JP Morgan, where he worked as a senior investment banker in their international mergers and acquisitions team. It was there that he advised the Glazer family on their takeover at Old Trafford, and was invited to join United in 2005. He was initially given a financial planning role, before taking on responsibility for United's commercial and media operations in 2007 and becoming a director in 2012. Woodward had no experience of working in sport before he joined United, but began attending Premier League shareholder meetings alongside Gill in 2012 in an attempt to increase his understanding of football politics. Match of the Day presenter Gary Lineker revealed on Twitter on Wednesday that Woodward is a neighbour. "Good heavens, my neighbour Ed Woodward is the new chief exec of Manchester United, taking over from David Gill, and he never said a word," Lineker tweeted. His new role will require him to work more closely with United boss Sir Alex Ferguson, who described Gill's departure as "a big loss". Ferguson, however, added that the expansion of Woodward's role would ensure continuity at the club. He said: "United are great at promoting from within and we have done it again with Ed Woodward stepping up. "Remember, David came as the finance director and ended up as chief executive. "From the football side, Mike Phelan came as reserve coach and ended up as my assistant. Rene Meulensteen came as a development coach and is now my first-team coach. Brian McClair came as a youth coach and is now director of the academy. "We see quality and potential in a lot of our staff. That happens throughout the club. There shouldn't be a big problem." The long-term future of Ferguson, who turned 71 in December, is arguably the biggest issue facing Woodward. Ferguson has not revealed any intention to retire, but Woodward told BBC Sport in October of his involvement in the plans to find a successor. He said: "We have a view as to what that process [appointing a new manager] will look like in terms of finding a replacement and what type of manager we want and how and when we'll go about it. "But it's in the drawer and long may it stay in the drawer."